The 20-day trek from Jiri to the Everest Base Camp is one of the most popular of the longer treks available. This trek has a number of stunning attractions, one of the foremost being the satisfaction gained by reaching the base of the highest mountain in the world. Other attractions include the spectacular scenery of the Himalayan ranges. 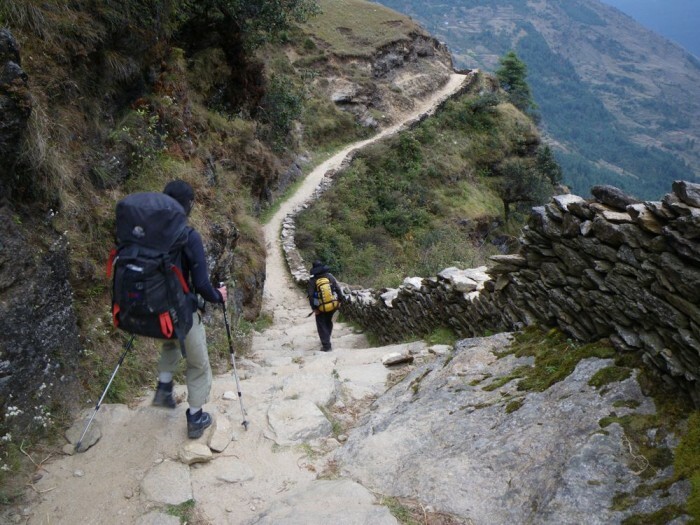 The Everest trek involves a tremendous amount of uphill and downhill walking. Drive by bus via the Arniko highway to Lamosangu. Whilst passing the old Newar towns of Banepa and Dulikhel you will have an excellent panoramic view of the eastern Himalayas, including Ganesh Himal, Langtang Lirung and Dorjee Lakpa. The road descends to Panchkhal, and then climbs over a ridge behind Dolalghat and follows the Sunkoshi north to Lamasangu. After passing several villages you will reach Jiri. The trek starts with a climb to the ridge top at 2370m then drops down to Shivalaya at 1750m. From Shivalaya it climbs again to Sangba Danda., Deurali Pass. From Deurali Danda it descends again to Bhandar, a small Sherpa village with a Tibetan Buddhist monastery where we spend a night. The trail passes gradually up through Lamjura Pass (3530m.) which is the highest point between Jiri and Namche Bazaar. The trail then descends through fir and rhododendron forest and emerges after one and half hrs. at Taktor. Traverse on the north side of the valley round a notch before dropping own to the Sherpa village of Junbesi for an overnight stop. The region around Junbesi is well worth exploring and a day spent here can offer a variety of alternatives. Two hrs walk to the north of Junbesi is the village of Phugmochhe (3100m.) where there is a traditional Sherpa art center. En-route to Phugmochhe a short diversion will allow a visit to Thuben Chhuling, a huge Tibetan Buddhist monastery. Below Junbesi the trail crosses the Junbesi Khola on a wooden bridge. Just beyond the bridge there is a trail junction. The route to Khumbu follows the left-hand trail that leads uphill. This trails turns north, descending through Salung. From the Dudhkoshi River the trail ascends to Ringmo and the Trak Shidno Pass. There are a few shepherds’ huts beside the trail, but the route is mostly hidden in dense forest. The trail crosses several picturesque streams on wooden bridges just before reaching Nunthala (Manidingma) at 2320m. Overnight stay. From the Nunthala, the trail continues to the Dudhkoshi at 1480m.and crosses it to follow the other bank. Most of the trail is well defined, although it sometimes meanders through terraced fields and between houses. It then descends steeply forests to a Chautara (resting place) overlooking the river. It follows the river for a while through forests then it climbs through terraces to reach the Rai village of Jubing (1667m). It climbs through the village around a ridge and aims for a prominent notch. From this notch we contour to the village of Khari Khola (2004m) to push on up the steep hill to Bupsa Danda. The trail descends from Khari Khola village and crosses a stream of the same name via a suspension bridge near some water driven mills at 2010m. After a steep climb to Bhupsa or Bhumsing (2300m), the trail continues to climb through a tributary valley filled with prickly leaned oak and rhododendron forest, where Languor monkeys may occasionally be seen. It descends (305m) and crosses the next tributary after one hour. Continue on the north side of the valley to reach Puiyan (2796m) for an overnight stay. The trail climbs for about an hour after puiyan to the ridge at 2800m followed by another ridge. The trail descends to Sukhe (Buwa) at 2293m situated on a tributary of the Dudhkoshi. The trail remains above the village circling it like an expressway. The village of Surkhe, at the bridge crossing the tributary below, is 2 hrs from Puiyan. The trail now leaves the tributary valley and heads more directly north towards Chaurikharka, another dispersed village. Before ascending to Chaurikharka 2713m the main trail crosses a spectacular deep gorge with a high waterfall 2408m and overnight stay at Phakding. Of approximately 5 hrs duration, this is a beautiful days walking through magnificent rhododendron, magnolia and fir forest. Several villages provide welcome teashops and the views of the peaks improve continuously until Namche is finally reached after a long pull up a ridge. Namche is the main Sherpa village and here we rest and enjoy an afternoon walking round the village. This is a rest and acclimatization day at Namche bazaar. Take a hike to Thami via Khunde, visit Khumjung or you can relax and explore Namche bazaar. After breakfast the trek continues to Phunki Thanga for launch. After launch it ascends another 2 hrs to reach Tengboche and pay a visit to the monastery with the guide. Today we walk through Tangboche village, the site of relics claimed to be a Yeti?s scalp and the fingers of a hand. These are kept in the Tangboche monastery and can be seen with the guide. This trail gives a good view of Pumori. This section also provides good views of Lhotse, the Khumbu valley and Amadablam. The trail from Lobuche follows the western side of the broad Khumbu valley and ascends gently through meadows beside the glacial moraine. After rounding a bend in the trail the conical peak of Pumori comes into view. On the lower slopes of this mountain a ridge extending to the south terminates in a small peak called Kala Pathhar, 5550m in high, and this provides the best vantage point from which to view Mt. Everest. You can go to the Kala Pathhar in the morning from Gorakshep and rest at Gorakshep. The trail makes a short descent on the sandy, flat expanse of Gorakshep. The trail from Gorakshep descends the Imja Khola valley then crosses the Khumbu Khola on a wooden bridge. Following the trail, you make a detour and continue up to Dingboche for an overnight stay. The trail descends to Phunki Thanga, ascends the ridge towards Sanasa, and then continues directly to Namche Bazaar. From Namche the steep descent back to the Bhotekoshi at Jorsale can be a bit tough on the knees. The trail from Jorsale to Lukla follows Chablung then turns off towards Lukla. Today we fly Lukla to Kathmandu which takes around 35 minutes. Today, you have whole day free for shopping and packing for your final departure. Today we will drop you at the airport for your final departure. Arrival and departure transportation, Kathmandu/ Jiri transportation/Lukla/Kathmandu flight tickets, 3 nights hotel in Acme Guest House with breakfast, Tims card and Permits, one guide, porters, their foods and insurance, in trekking your accommodation, food( breakfast, lunch and dinner) etc.